GET WILD! 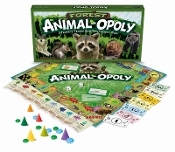 In Forest Animal-opoly players collect their favorites and play to be the best Caretaker of the forest by providing food and water for their animals. While playing, flip over the deeds and read fun facts about each animal. Did you know bears use the same trails over and over for generations and tend to place their feet in exactly the same place every time they use the trail? Or that playing possum comes from the fact that when unable to flee a possum may fall into an involuntary shock like state? How about the fact that skunks can spray 15 feet or more? LOOK OUT! It's all fun and games until you land on GO TO HEADLIGHTS... then you’re caught in the headlights and out for 3 turns! Who knows? You may become the caretaker of a really big bison, or maybe a little weasel. Whatever happens... it’s gonna be wild! GRAB A TOKEN AND GET READY TO PROWL!